The trial version of CaRIne 4.0 is now available for Windows. Download it to learn how it became easy to create complex structures. Keep the contact with CaRIne and get all the power of it by downloading and installing all the last added functionalities. The last version brings numerous tutorials that will make you becoming experts. Get the last version of CaRIne. CaRIne Crystallography is a crystallographic software which has been developed since 1989 and which is used by thousands of persons around the world for teaching, research and edition is now available in a totally rethought version. 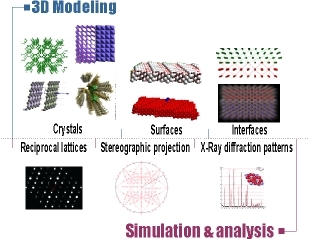 The first part of this new version 4.0 is focused on 3D modeling of unit cells, crystals, surfaces, grain boundaries and interfaces. Those different functions are usually distributed in several software. CaRIne brings them together in a friendly graphic user interface. This is time and cost saving. Moreover CaRIne displays in a clear way the relations which exist between the different representations which is all the most appreciated among the teaching world. CaRIne is curently used in 30 countries by more than 2000 teams and laboratories for research and teaching in the physics and chemistry, materials science and earth science fields. Copyright © 1989-2005. Cyrille Boudias & Daniel Monceau. All rights Reserved.